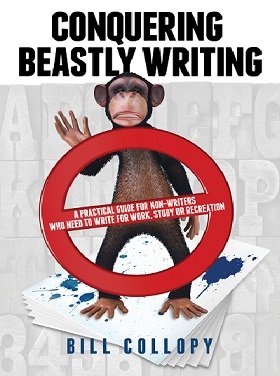 Bill’s education and language appreciation book, Conquering Beastly Writing, was recently published by JoJo Publishing. It’s a fun approach to a traditionally dry subject, including many contemporary examples where writing has gone sour for writers in business, politics and public policy. The book comprises 350 pages of suggestions for improving the effectiveness of writing for people who don’t consider themselves to be writers. At the same time, it’s also a joyful journey through historical and modern byways of the English language. Good one. How do you buy one? Search engines sometimes refer to the original title (Banish the Animal) but it’s the same book.